EC744G Universal Love. Compassion. Purity. Gold vermeil heart chakra anahata earrings with a green stone. Gold Vermeil (18 k gold plated over Sterling silver). Made in Thailand. Universal Love. Compassion. Purity. Anklet for the heart chakra has a mantra charm on an adjustable, green microfiber suede (vegetarian, 9-10") anklet with silver clasp. Gold Vermeil Heart Chakra Charm with emerald colored cubic zirconia. Heart chakra charm has a clasp so you can add it to most of our necklaces or bracelets to make your own heart chakra jewelry or create a combination of all the chakras you want. Universal Love. Compassion. Purity. 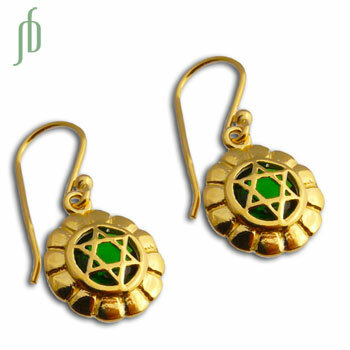 Sterling silver heart chakra anahata earrings with a green stone.